Press Conference - Tuesday - April 17 - 2 pm - Lafayette Park - Washington, D.C.
WASHINGTON, DC, USA, April 16, 2018 /EINPresswire.com/ -- Famed social activist, Professor, Dr. Cornel West, Attorney Malik Zulu Shabazz (National President of Black Lawyers for Justice) New Black Panther Party, Black Lives Matter and the American Indian Movement, families of police killings, H. U. 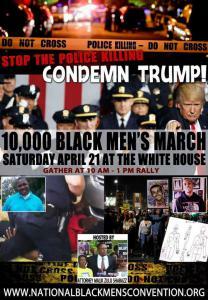 Resist, and 100 Black organizations will rally and 'Condemn Donald Trump' Saturday, April 21 (1 pm – 6 pm). Invited and expected to attend are Congressional Black Caucus Members, Rep. Maxine Waters (D-CA), and NAACP leaders. Organizers have invited former U.S. President Barack Obama to come out and address the serious issues involving his predecessor Donald Trump; an answer is expected this week. The occasion is the 10,000 Black Men's March. Men, women and all major activist groups will be in attendance. Following the rally, over 10,000 Black Men will march up 16th street NW – up 14th Street NE – and down U Street NW in a powerful display of unity and solidarity. The city will be shut down. In the 2010 election season, the New Black Panther Party drew the ire of the GOP. The GOP accused then-Attorney General Eric Holder of "coddling the Panthers” and not prosecuting them after the 2008 Philadelphia voting booth scandal. "Washington D.C. and the government needs to be shut down over the outrages and racist excesses of Donald Trump. It would not surprise me if the whole city and highways come to halt Saturday, April 21" claims Black Lives Matter New York Activist, Hawk Newsome. 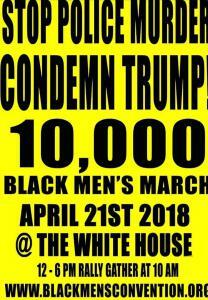 March and Rally host Malik Shabazz, Esq., former Chairman of the New Black Panther Party stated, "The National Black Men's Convention is highlighted by a White House rally that will be the most powerful message yet, sent to Donald Trump announcing his soon to be removed from office." Shabazz and Black Lawyers for Justice led the 3-19 Congressional Lobbying campaign that urged Congress members to 'Condemn Trump and Not Louis Farrakhan' who made a controversial alleged anti-Semitic speech on 2-18-2018. 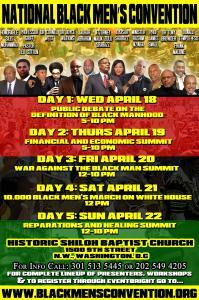 Shabazz is a protege of Louis Farrakhan, is inspired by the Million Man March of 23 years ago.